comfortable in her perfect imperfection. I love chickens. I think they are beautiful birds. In particular, though, while roosters are undeniably gorgeous, it’s the girls, the hens, I like to spend time woolgathering about. To have my own small flock of girls would be a dream come true. I’ve been infatuated with the idea of keeping a few laying hens for a long time now. But, unlike New York City, Calgary does not allow chickens. 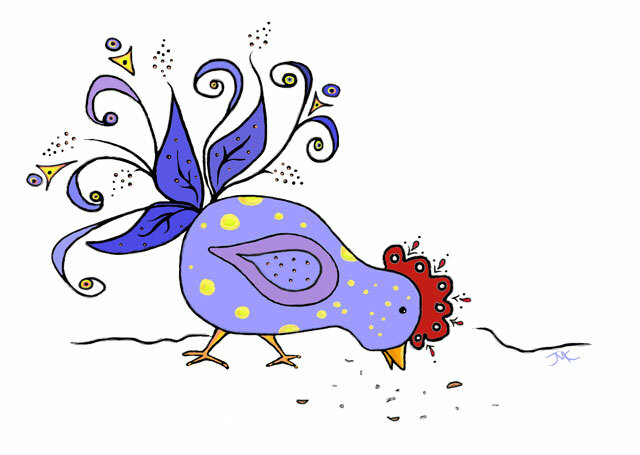 So, unless I move away from the city, dreaming about chickens is my only option (and not a bad one either–dreaming about chickens simply makes me happy). Fun, Festive, Flirty and Chocolitious! These tasty chocolate lollipops couldn’t be easier to make. All you need is 16 ounces of an excellent quality chocolate, about a 1/2 cup (each) of two kinds of garnish of your choice and a playful spirit. They are especially fun to make with kids, small or big! I like to use a combination of semi-sweet dark chocolate and milk chocolate for my lollipops, but you can use any chocolate you prefer: bitter-sweet, semi-sweet, milk chocolate (or any combination thereof) or even white chocolate. Dried fruit and toasted nuts make excellent topping choices, but go wild with any toppings you’d like. The only goal here is to have fun with it. Also, it doesn’t hurt to get a lot of chocolate on your fingers as you clean up, just so you have to lick them. Until now, I’ve always tempered my chocolate using a double boiler and I admit that my chocolate didn’t always come out perfectly. This time, I tried Jacque Torres’ microwave chocolate-tempering method (see reference links below) as outlined by Ina Garten. Somewhat hesitant to try this method (as I rarely use my microwave for anything other than softening butter or heating up leftover pizza), I decided to give it a whirl. And I’m happy to report that I’m delighted with the microwave chocolate tempering method! It couldn’t be easier and it worked perfectly, resulting in a smooth, glossy, well-tempered chocolate. I will never use the double boiler again! Ah… it’s that fun time of year again when Peter and Lillian come around. They generally show up sometime in early spring, I’m never quite sure exactly when they’ll arrive, I just know they always do. I love seeing them. They stay for a couple of weeks and hide foil-wrapped chocolate eggs all about the place—now that’s my kind of house guest. It’s very fun when they’re around because I never know where I might find a little chocolate treat: in my make-up bag, in the butter-keeper, perched on top of a picture frame or in an empty pot in the cupboard. It takes me a while to find them all, especially as they seem to replenish them often. And they are so good at hiding them that I often find some long after they’ve left. Few things feel more delightful than having a sweet little bird alight upon your hand. A couple years back, my partner and I discovered an enchanting little conifer grove where the Black-capped Chickadees and Red-breasted Nuthatches like to hang out on Prince’s Island, our beautiful downtown city park. For many years we’ve walked by this particular grove totally unaware of it’s hidden treasures. One very cold, bright winter morning, we remembered to fill our pockets with unsalted peanuts in the shell for our squirrel friends and stopped by the grove to toss them a few peanuts. We sat on the ground in the middle of the grove, leaning up against a large tree trunk and waited for our furry friends to appear. It wasn’t long before several Grey squirrels descended the surrounding trees to check us out. Then, much to our delight, as my partner held out a peanut for an approaching squirrel, a chickadee swooped in, landed atop the peanut and took a few unsuccessful pecks at the shell! When something seemingly goes wrong, I don’t use the word “failure” anymore. Instead, I like to call it what I’ve come to see it as: a honing or tempering experience. I believe that the specific language we use creates an internal framework which influences how we perceive and experience our world. Therefore, I try to eliminate words such as “mistake”, “failure” and “wrong” from my vocabulary, replacing them with phrases such as “a learning experience”, “just one step along my journey” or “a clarifying experience”. For me, this kind of mental shift and self-soothing increases the probability that I’ll be able to see the benefit of an experience. Whenever I blame myself (or anyone else), not only does it feel bad, it keeps me from being able to see the value of my experience. Moonlight Mouse knew two things for sure: he knew what he wanted and he knew where to find it. The only uncertain part was knowing exactly how he would get it. But Moonlight did not call it uncertainty. He called it fun, he called it an adventure—it was the delicious figuring-it-out-as-you-go part. His best friend, Timothy, did not share his perspective, but no amount of dissuasion could diffuse Moonlight’s stubborn determination to venture into the potentially treacherous kitchen of “The Giant Ones” (as people are known to mice). He’d caught a whiff of something delectable wafting out from there, and now his desire to sample it was powerful. Moonlight’s olfactory abilities were extraordinary, even for a mouse. He was gifted, to be sure: Moonlight’s nose was so refined that, often, he could accurately identify a scent from just a single molecule. He couldn’t help it that he had such a keen sense of smell and a finely-tuned palate—he simply had to follow the intoxicating scent trail, which he believed (if his incredibly discerning nose was correct), would lead him to a very fine, handcrafted, ten year old aged cheddar. Moonlight Mouse fancied his cheese extra-sharp. “A small nibble”, he thought, “just a wee morsel is all I need for a little midnight snack”. For me, music is like air: it’s vital to my well-being and happiness. It feeds my body, my mind, and my soul. I need it as much as the air I breathe. I love the diversity of music available at our finger tips. I love that there are so many musical styles and genres to choose from. I love the musicians, singers, songwriters and composers of this world. I appreciate all the recording and sound engineers out there putting it all together so we can enjoy listening to fabulous music almost anywhere. I also love any project or happy gathering, live or otherwise, that can bring together the diverse peoples and cultures which weave the beautiful tapestry of this planet. And I’ll never cease to wonder at all the technology which makes such a project possible (including the fact that I have the capability to share some of it via this blog). 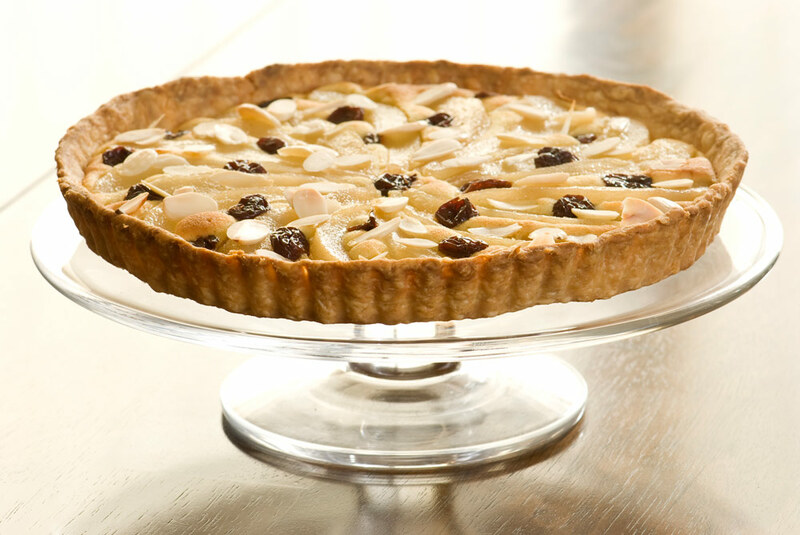 This recipe is adapted from an excellent recipe by pastry chef David Lebovitz. And like his Red Wine Poached Pear Tart, his French Pear & Almond Tart is an incredibly delicious dessert—arguably my current all time favourite dessert ever. 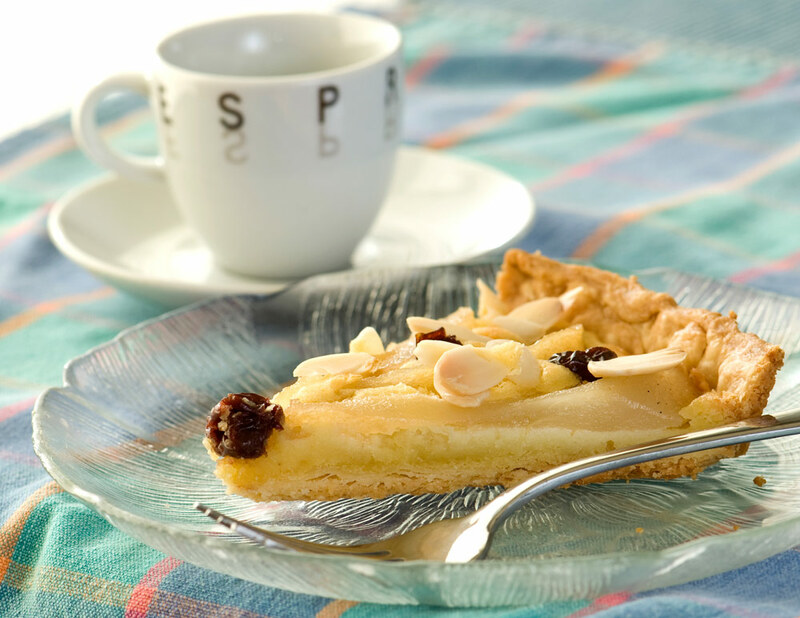 If you love the flavour of vanilla, pears and sweet almond (with notes of kirsch-soaked sour cherries popping in here and there), one bite of this tart and you’ll be transported into a heavenly realm, leaving you in a pleasantly speechless stupor. An overload of pleasure neurons firing simultaneously in the brain may cause some guests to swoon or faint after sampling this dessert. It is advisable to keep smelling salts on hand when serving. Be further advised that some guests may refuse to leave your home, or may appear camped out on your doorstep the next morning, begging for more. Don’t say I didn’t warn you: Highly Addictive.